The holiday season is exciting in itself but when you factor in the large number of engagements that occur around the holidays, it makes it even more exciting. 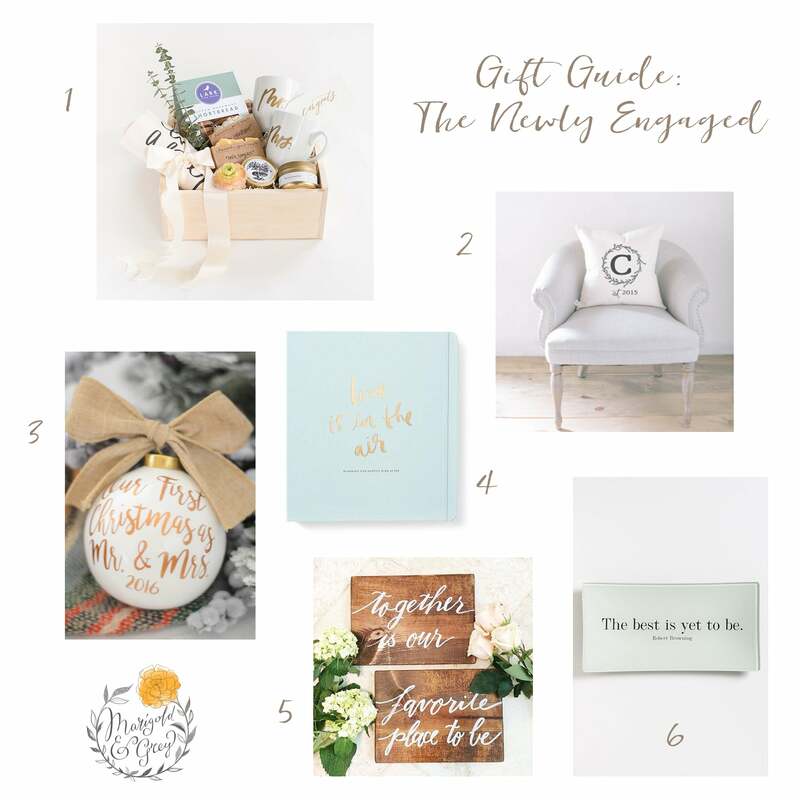 Today I'm sharing some of my favorite holiday gift ideas for the newly engaged couple on your list. We designed this gift box to congratulate both the bride-to-be and the groom-to-be. 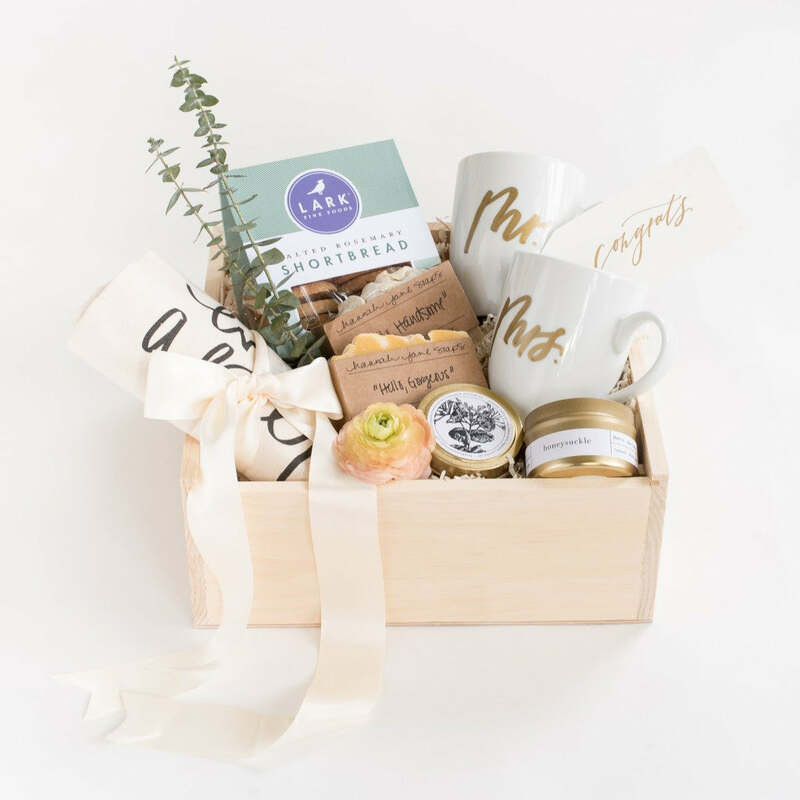 Featuring our signature "Mr" and "Mrs" mug set, handmade soaps, a 'happily ever after' tea towel, artisan candle and a box of gourmet shortbread cookies, this curated gift box sets the tone for an exciting time of wedding planning ahead. I adore this customizable pillow by our friends at Parris Chic Boutique. It's great way to get a newly engaged couple excited about their upcoming nuptials. Featuring the couples initial surrounded by an organic wreath and finished off with the year of their wedding. We love the idea of a Christmas tree ornament signifying the couple's first Christmas together as a Mr & Mrs. There are four options for ribbon but personally, I love the Christmas plaid. It's the perfect festive finishing touch! 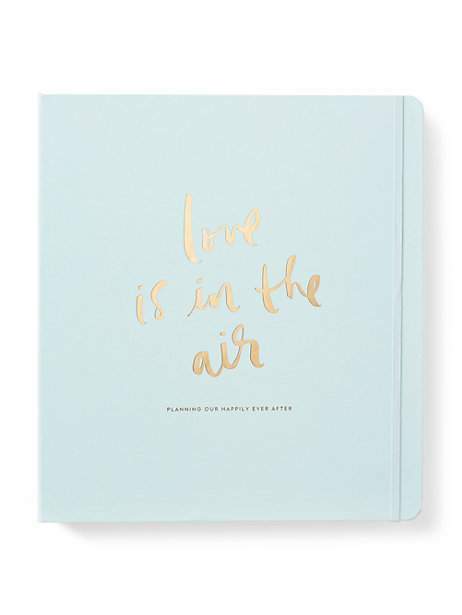 Not only is Kate Spade's Bridal Planner a great way to keep the bride-to-be organized, it also makes the perfect 'something blue'. Can't go wrong with the gold 3-ring binder and 48 planning pages. It even has an inside pocket for added organizational capability. You absolutely cannot go wrong with Laura Hooper for invitations and day-of paper and accessories. 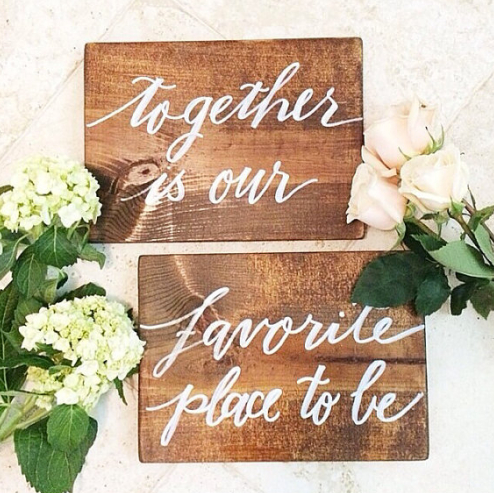 We especially love her line of wooden signage that can either be used day-of or even after the wedding, like these! The best is yet to be. This Robert Browning quote has never looked better! Handmade in France using a découpage method, we are smitten with this modern day keepsake that is not only functional but perfect as a display item as well. The perfect sentiment for any newly engaged couple just embarking on their future together. We hope this round-up has been helpful and that you're on your way to just the perfect gift for the newly engaged couple! Stay tuned for more holiday gift guides over the coming days. After all, it's always our goal to make gifting easy. Happy Holidays!